Learn why dealing with night terrors needs to be treated differently than nightmares. Night terrors in toddlers can be a disturbing sleep disorder that mostly occurs with very young toddlers. As it involves awakening in the night fearful, it is very unpleasant for children and parents alike. It can be very frustrating when it happens frequently. However, there are some simple things that can be done to resolve them. While every child may have an occasional bad dream, dealing with night terrors is usually an ongoing situation and needs to be treated differently than if he has a bad dream now and then. When a toddler seems frightened, though he isn't easily awakened, he may sit up, walk around, scream or talk rapidly. This is probably a night terror situation. The episodes can last from 10 to 30 minutes, often are not remembered later, and usually happen within two hours of bed time. Ensure that your child feels and is safe. Always ensure that he won't get hurt in the middle of the night. Keep all toys far away from the bed area. Make sure the child knows there are locks on doors and windows. This works well for his own safety, as well, should he move around when you aren't in the room. Give your child his bath in the day time instead of in the evening. Keep television watching to a minimum. Television can greatly stimulate children and could contribute to night terrors. Do not play loud or raucous music right before bedtime. Limit his physical activity so that he experiences a period of slowness before bed time. Institute a quiet period after the dinner hour. Keep your child as relaxed as possible right before bedtime. Read a light story to your child before bedtime, but stay away from books that are stressful or scary. After your child goes to bed, use this time to relax yourself. Sometimes loud activity such as music and television can stimulate and disrupt a child's sleep patterns. Also be mindful of loud talking either in person or on the phone and arguing or other forms of intensity. 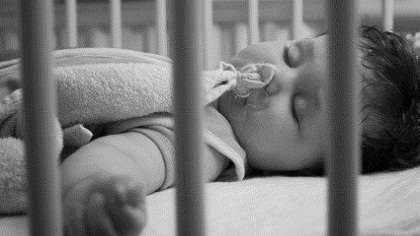 Some children are light sleepers, just as adults are. The more serene your environment is, the better your child will respond and the safer he will feel. Ensure that your toddler has a nap each day. Often, night terrors can be caused due to exhaustion. Be sure that he is put to bed at a reasonable and consistent hour each night. Monitor your child after he is put to bed. Occasionally listen at the door to ensure that your child is sleeping peacefully. Usually children have night terrors within the first two hours of sleep time. Watch for agitation and fitfulness. Wake him up for a few minutes at that time. Sometimes this can head off a night terror. Keep a record of the time that the night terrors begin. Mark down on a chart the time he goes to bed and the time when he becomes restless. Arrange to wake him up at the start of restlessness as a routine. If this is done regularly, eventually the night terrors may solve themselves.